I can't wait to put this on my bed in my new beach house. 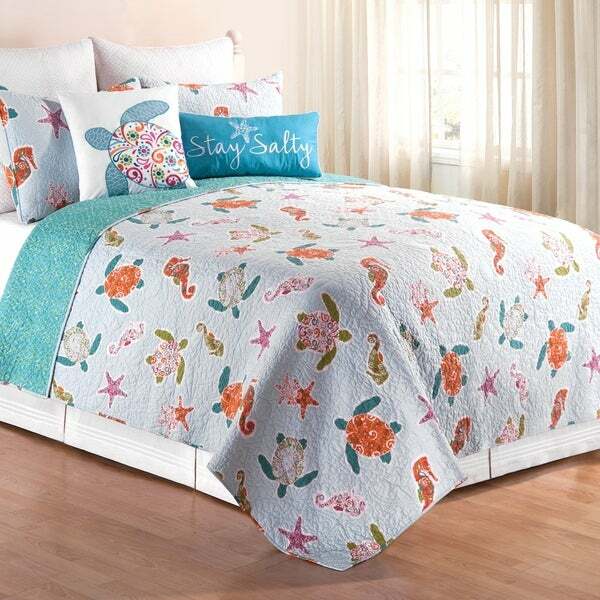 Bring a little ocean magic to your bedroom with the bright and whimsical St. Kitts quilt set. Vibrant shades of blue, aqua, green, orange, fuschia, and pink create set a fun, lighthearted tone perfect for a beach house or child's bedroom. Reverse to an alternate look with just the flip of a quilt. Made of Cotton and machine washable for easy care. Dimensions 92.0 In. X 108.0 In. X 1.0 In. I totally love my new quilt. The quality was exceptional, and the colors are very vibrant. I highly recommend this brand as I have bought several quilts/bedspreads. This quilt even brightens up the bedroom. Fun colorful quilt. Even nicer than I expected. Lots of colors so able to coordinate fun beachy items in bedroom. Beautiful quilt! Colors are vivid and bright. It washes well, too! Cute and well sized. I’ve washed it several times and it washes well. 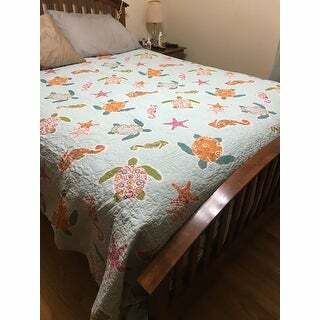 Quilt gives our bedroom a beachy look. This isn’t a heavy or thick quilt, which is what I wanted. I would rather add a light blanket when it is cold than roast when it isn’t. I do wish the fabric was softer. Just what I wanted. Perfect for the cooler South Florida nights. My grand daughter loves the sea creatures on it!. High quality. My only complaint would be the king size should be about 4-6" wider. "Does this come with a sham? The description said quilt. So I wanted to be sure."